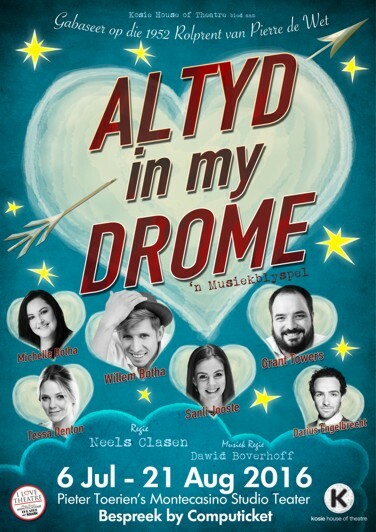 An exciting new Afrikaans musical is coming to Pieter Toerien’s Montecasino Studio Teater, based on the 1952 hit film by Pierre de Wet: ALTYD IN MY DROME. Starring Willem Botha, Grant Towers, Michelle Botha, Tessa Denton, Sanli Jooste and Darius Engelbrecht. The producers of the runaway successes VETTIE VETTIE!, TWEE VIR DIE PRYS VAN EEN and MARION HOLM VIR BEGINNERS in 2014 and 2015 – Kosie House of Theatre – are staging this brand new musical with an original score. The production opens at Pieter Toerien’s Montecasino Studio Theatre in Johannesburg for a seven week run on 6 July 2016. It is part of Kosie House of Theatre’s Afrikaans season at said theatre. Originally created as a movie by Pierre de Wet with Al Debbo and Frederik Burgers, adapted for the stage by Neels Clasen and Dawid Boverhoff. Family entertainment with lots of laughter and sing-alongs!